A 37-key keyboard with room for 107 HP’s worth of Eurorack modules built in! A great idea that’s nicely thought-out and well implemented, the only thing holding the kb37 back is its high price tag. Clock output can run from internal or external clock. The price is high considering you also have to budget for modules to control. 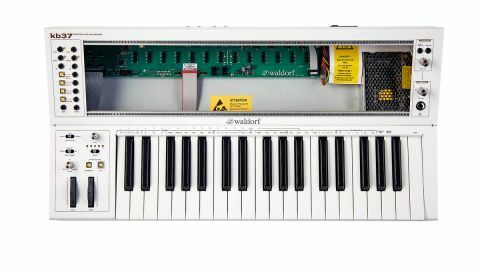 There appears to be no slowing in the race to modular nirvana, and Waldorf is certainly not going to be left out. In recent months, it has introduced a range of Eurorack modules catering for host of generation and processing duties, but it’s the kb37 that is perhaps the most intriguing. The concept is simple: build a modular rack into a keyboard. This, of course, begs a question - why haven’t we seen more of these? The modular concept has seen increasing interest in a number of areas of the music technology landscape. 500-series module racks for audio processing can now be found built directly into mixing desk designs, and modular synthesis has exploded with hundreds of small-scale producers and numerous DIYers getting in on the game. That’s all well and good, but unless you use a rack-based sequencer, most of the time the modules are separate from any physical controller... but what if you want to perform live or create your own immediately playable system? Waldorf think they have the answer. At its heart, the kb37 features a large empty space where you can place your choice (up to 107HP) of Eurorack toys. Maximum module depth is 65mm, though the rightmost 15HP has only 25mm of clearance. The kb37 should therefore accommodate most modules, although it would be worth checking that your current stock is compatible before taking the plunge. Below this is the keyboard, with its 37 full-size keys. This feels nice to play and also generates velocity and aftertouch information. Some synth modules will only require the audio to be connected before getting up and running. Modules draw power (up to 1.5A) from the standard Doepfer-style backplane, which (by default) has its CV and Gate lines linked to the onboard CV interface. This means that some synth modules will only require the audio to be connected before getting up and running. The small audio panel on the extreme right has two audio inputs that route sound to the back-panel jack and front-panel headphone socket. Each of these gets its own volume control. At the other end, the CV Panel deals with the other aspect of interfacing, and there are enough outputs here to keep most people happy. Alongside the expected Gate and Pitch CV, you also get Clock outs (from the internal clock generator, or via MIDI/USB clock) as well as a wide range of other control sources (including the sensor input on the rear). Throw in an arpeggiator, Glide control and multiple note trigger modes and you’re almost done. The kb37 is a very nicely designed piece of kit and helps turn a bunch of modules into a self-contained playable synthesis system. However, at nearly £800 - before even beginning to add any of the all-important modules to the bill - it represents a serious investment.